Tyler Hubbard's daughter Olivia has a growing appreciation for things with wheels--- check out the youngster's pint-sized rides here! Florida Georgia Line star Tyler Hubbard‘s daughter Olivia is the proud owner of two impressive sets of wheels! Yes, that’s the little one posed between miniature versions of a Mercedes and a Porsche! “I have no words😂 it may have taken a couple of us and the Itsy Bitsy Spider and us acting like fools to get her to stand still in between her cars but i hope she’ll laugh and thank us one day for a good tbt,” Hayley Hubbard captioned the hilarious photo below. 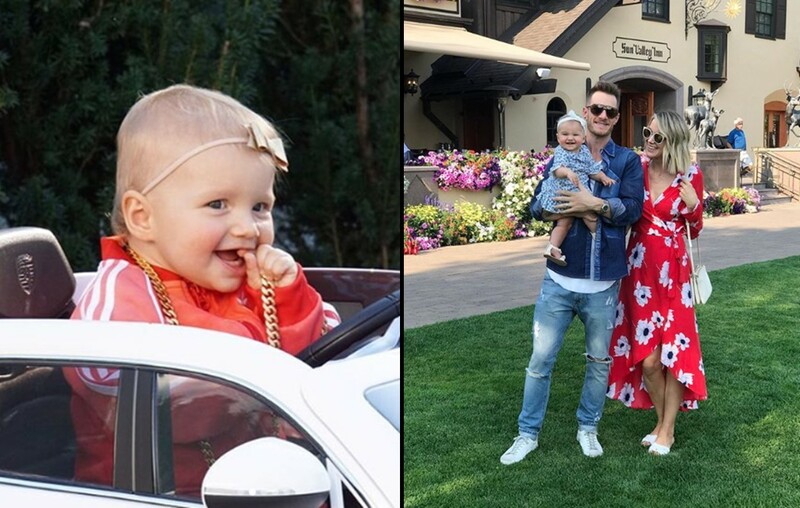 As if a picture of Olivia sporting a red track suit and a gold chain wasn’t enough, Tyler also posted a set of pictures as well as a video of his daughter ‘driving’ (the car is controlled by a remote) down their driveway. “This is what I get to come home to. Just speechless really. Guess she just got that swag. Lol… #likemotherlikedaughter,” the “Simple” singer captioned the snapshot of Olivia and Hayley in their twinning cars. Stay tuned, in a few years Olivia might be whipping around in a normal sized Porsche or Mercedes just like her mama! “Olivia’s favorite word today #Whoa #wordoftheday #shelovesshoes” her mother explained to Instagram followers. Be sure to share these cute moments with other Florida Georgia Line fans!